It may be more than low refrigerant thatï¿½s causing your carï¿½s air conditioner to blow hot air instead of a cooling breeze. Automotive air conditioning systems rely on just one of two refrigerants to keep things cool and comfortable. Cars made before 1993 use R12, or FreonÂ®, and vehicles made after use 134a. R12 refrigerant is no longer available to the consumer because of environmental concerns, but is still available for use by trained technicians and installers. That's why, if you own an older model vehicle, there is no need for you to learn how to charge a car air conditioner! In fact, the main reason R12 is still available is these same technicians have continued to recycle, clean, and reuse the remaining supply. New R12 is no longer being manufactured. This was the whole point of the laws in the first place. Amateurs were venting R12 into the atmosphere, which would put holes in the ozone layer - a decided (and finally determined) definite No No! The decision was made to regulate the use of R12 for safety's sake to avoid a permanently sunburned planet. Therefore, if your vehicle was made before 1993, there's a great probability that it uses R12, or FreonÂ®, as a refrigerant. After 1993, all vehicles in the United States were required by the EPA to use 134a as a refrigerant. The future holds even more refrigerant alternatives but, for the time being, these two refrigerants are the heavy hitters of automotive air conditioning systems. A person's first reaction when an AC system stops working is to search the garage to find a can of refrigerant and then go recharging crazy. Don't do it! Recharging a leaky system is not only a waste of money and time, but is a temporary fix at bestâ€”and may contribute to the aforementioned planetary permanent sunburn problem, even with the new and improved refrigerant. Conversely, overcharging an AC system can actually decrease performance and work against the production of cooling interior breezes. Also note that attempting to charge an R12 system with a can of 134a can not only lead to problems, but can also be dangerous, as the two refrigerants are not compatible. While the refrigerant itself is a major player in the hot-air-into-cool-breeze act of the air conditioning system, it is only one player on the team. The compressor, condenser, evaporator, and all hoses, o-rings, vents and gizmos must be working together to bring the cool breeze flowing across your face inside the vehicle on a hot summer day. If the air conditioning system is losing refrigerant, the compressor isn't compressing, or the evaporator has evaporated. There is no great conspiracy afoot, just leaks not keeping the refrigerant inside where it belongs, or component parts that have gone awry and that's according to car experts. Now do you see why it's really not such a great idea for you to learn how to charge a car air conditioner? The first step to take in bringing back the chill is to determining what's wrong with the AC system. Malfunctions can be caused by something as simple as a plastic grocery bag stuck in a vent, a recalcitrant relay, or a broken compressor drive belt. While a small amount of refrigerant leakage occurs over time, major leaks should be found and repaired first before attempting to recharge an AC system. 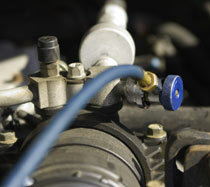 To determine what's going on with an AC system, the best bet is to take the vehicle to an authorized repair center. A technician can test the system for leaks, measure temperature output, determine which components are working or not, and recharge the system in one motion, if all is well. If you are an authorized AC technician, you already know how to charge a car air conditioner, and if you're not, one article is not going to help you! Switching over to an R134a refrigerant may be the solution to a leaking R12 system if the components are worn enough to justify replacement with updated parts. The high and low pressure hoses, o-rings, and all associated junctions must be updated to work with R134a if the decision is made to switch, rather than fight. The many cars that still run with R12 can be serviced, but if removal and replacement of a compressor or condenser is required, a switch to 134a may be a good call. Updating the hoses, o-rings and components to work with 134a is best done when the system is apart and discharged. A temperature sensor is inserted into the AC vent and the system's efficiency is tested. The high-pressure side of the system is connected to the recycling-recharging testing machine, then the low-pressure side. The machine reclaims and stores the refrigerant. The system is then run under a vacuum for 30 minutes to test for leaks. This process also removes accumulated moisture. If all is well, the refrigerant is reintroduced into the system, and topped off as required. The sight glass on the evaporator is literally a window into the AC system. If the window is not clear, or bubbles are visible, this can indicate system trouble. So, if you're watching someone else work, you can appear knowledgeable on how to charge a car air conditioner!